Gary North’s message for right-wing protectionists. – Referring to indirect taxes as “loot[ing]” is hyperbolic rhetoric. It is also ironic that a supposed opponent of world government would argue against constitutional and voluntary methods of taxation that serve as a bulwark against world government by promoting national borders. What Causes an Economic Depression? And how to cure it, by Murray Rothbard. – Promotes the notion that an increase in the supply of money is the sole cause of an economic depression, as opposed to the combination of an increase and subsequent decrease. Are We Austrians Shills for the Bankers? So claims a money crank. Article by Tom Woods. – Methinks Tom Woods doth protest too much! Also, “money crank” is an ad hominem fallacy, though it was probably added by Lew Rockwell or the Webmaster, and not by Tom Woods. Should Libertarians Accept Social Security? Laurence Vance on why Ron Paul is right. – Predictably argues that libertarians should accept a government benefit. While I agree with taking back exactly what you’ve paid into the system, I find it ironic that those who purport to hate government so much conveniently find ways to recognize the authority of an unlawful government, and to accept benefits from it, such as I documented with the tax-exempt status of the Mises Institute. 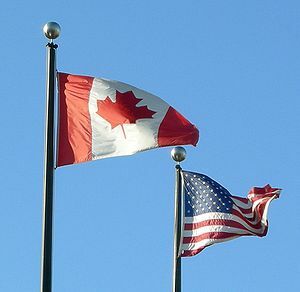 Is Canada Freer Than the US? For one thing, it’s not a police state like the US, says Ron Holland. Also, there’s little private crime. – Yes, Canada is more economically free than the U.S., as I have documented here, and have confirmed with my own personal observations from living in Canada. Note: Federal taxes are lower in Canada than in the U.S., overall. As of January 1, 2012, the top marginal personal income tax rate is 29% compared to 35%, top capital gains tax rate of 14.5% for all capital gains compared to 15% only for gains acquired over at least a year in the U.S., a top corporate tax rate of 16.5% compared to 35%, and no inheritance tax, compared to the top rate of 35% in the U.S.